How to avoid sending the existing submissions to MailChimp? I am trying to avoid an additional upload of previous submissions to my integrated 3rd party apps. For example, if my form is integrated with mail chimp and i edit the integration, it re-sends prior submissions. That affects my existing mail chimp contact. I am trying to avoid that. Note: when editing the integration, I left the "update" existing contact unchecked but I suspect that is not the fix. If you have unchecked the option Update existing contact, if the same email found in the MailChimp list the list will be updated with the other fields mapped. 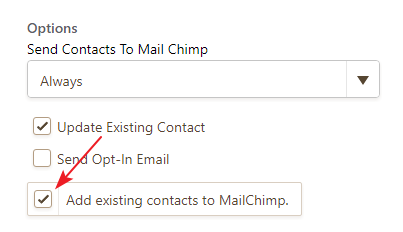 Could you try removing the MailChimp integration on the form and then try reintegrating it by unchecking the option 'Add existing contacts to MailChimp'?